Robert C. Buttolph and Leona Benell were scheduled to be married on March 8 of 1911 at 4 PM at St. Matthews Episcopal Church in Manhattan. After a great evening with family, Robert agreed to meet Leona the next day, the morning of their wedding, at 10 AM. Robert didn’t show up and the family began a search for him. They were unable to locate him, so the police were called in. Did he get cold feet and run away? Was Robert mugged or murdered? Did he jump off the nearby arch of the Riverside Drive viaduct? It was none of these. At 2 PM that afternoon, Robert walked right into his parents’ apartment. It turns out that he had stopped off to visit a friend the previous night and fell asleep there. He was such an abnormally sound sleeper that he slept right through to that afternoon. The couple was married at the church at 4 PM that day, just as scheduled. He saved up his money and eventually had enough to open a grocery store on US Route 60 near St. Albans, West Virginia. The store was named after his ex-wife Georgie, who he had recently divorced on March 14, 1951 after 14-years of marriage. Shortly after the divorce, the store was sold and Jesse Garrett officially became a retired man. But he was not without an income or assets. Rentals of houses that he owned provided Jesse with a steady income and he claimed to be worth in excess of $28,000, which would be more than a quarter of a million dollars today when adjusted for inflation. Jessie Garrett looking at one his many replies with his sons James, Jr. (left) and Jimmie (right). Image appeared on page 7 of the June 18, 1952 publication of the Salisbury Daily Times. The press caught up with the ex-Mrs. Garrett and she made it clear that Jesse was no bargain, even with all the money that he claimed to have. Georgie didn’t elaborate, but her warning message to all of the women out there was perfectly clear. She did state, “I’m not sure about his exact age.” Noting that he lacked a birth certificate, she added, “I know he was 49 for a year or two while he and I were married.” My calculations indicate that he was really a couple of months shy of his 54th birthday at the time. Just for the record, the former Georgie Garrett was 32-years-old, weighed 100 pounds (45 kg) and stood 59-1/2” (151 cm) tall. In other words, the boys didn’t have a fat mama. With thousands of women expressing interest in a possible marriage, Jesse began the process of selecting the bride-to-be. He did express disappointment that only one woman from Rockport had contacted him, but she was quickly knocked out of the running. Many women went out of their way to catch Jesse’s interest. Some sent photographs of themselves in bathing suits, of their children, their homes, their cars, and more. He said that he wasn’t interested in women who sexually teased him or those from Canada who wrote in French. Even a woman worth $2,500,000 didn’t make the cut. Clearly unhappy with some of Jesse’s female specifications, a lady from Minnesota wrote, “Don’t forget, you’re not buying a horse or cow. And listen, boy, you’re no spring chicken yourself. Jesse interviewed twenty-six applicants and decided that Mrs. Maxine Berry, a 30-year-old redhead, would make the perfect wife and mother to his children. Unfortunately, she got cold feet and removed her name from his list of possibilities. On June 23rd, twelve days after Jesse’s story broke in the national news, date #25 announced that she had accepted Jesse’s proposal of marriage. She was 33-year-old Mrs. Etta R. Crosbie, who worked in the classified ad department of the Elkhart Truth newspaper. Mrs. Crosbie said that she had answered Garrett on a dare. 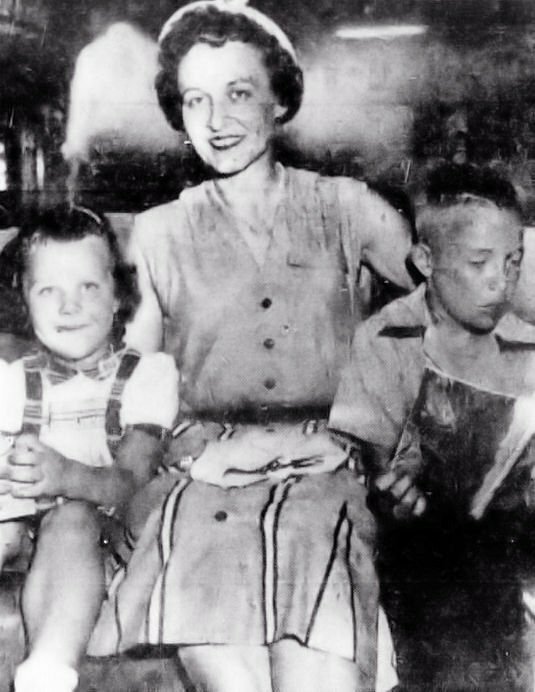 Mrs. Etta R. Crosbie of Elkhart, Indiana with her daughter Karin on the left and son Quin on the right. 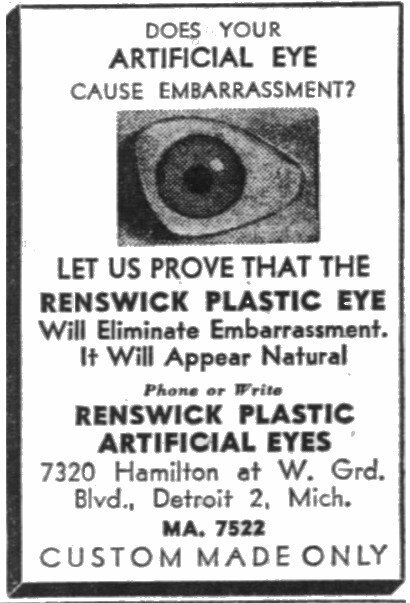 Image appeared on page 12 of the June 26, 1952 issue of the Mount Vernon Register News. Etta had married her first husband, Rollo M. Crosbie in 1938. Sadly, he passed away on October 6, 1947 at the young age of 33. She was alone to raise her two children, Quin and Karin, who were aged ten and five, respectively, at the time that she accepted Jesse Garrett’s proposal. And, yes, the two Garrett boys had a hand in choosing their soon-to-be stepmother. “The boys were along when Mr. Garrett visited me a few days ago. I believe they decided I was O.K.” In other words, Etta wasn’t going to be a fat mama. 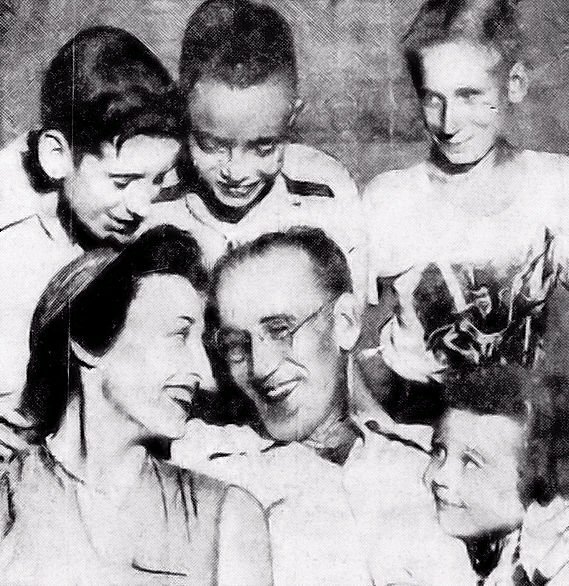 Etta R. Crosbie and Jesse L. Garrett with their children: Karin Crosbie (lower Right) and Jimmy Garrett, Quin Crosbie, and Jesse Garrett, Jr. (left to right in the back row). 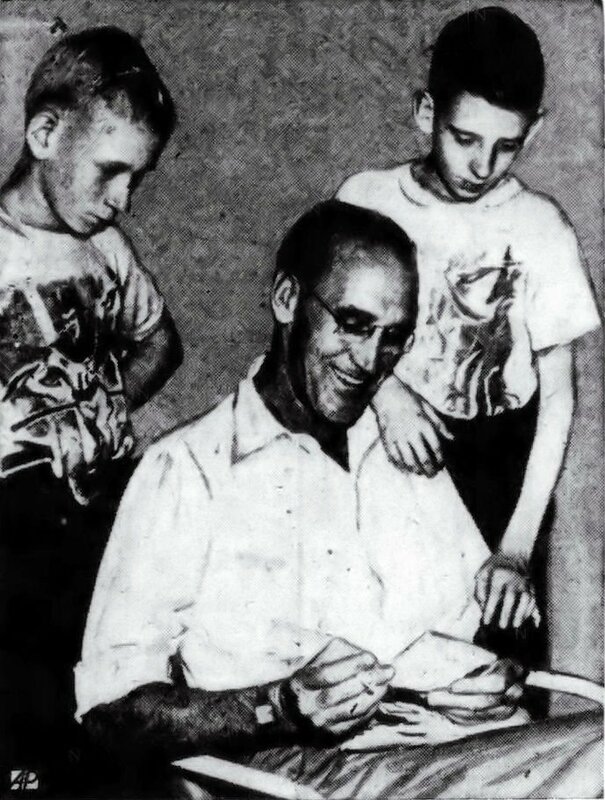 Image from the June 26, 1952 issue of the Cedar Rapids Gazette on page 30. The plan was for the two to wed as soon as possible. Garrett said that they had an offer from WFMB, at the time the only television station in Indianapolis, to wed on the air. At first Mrs. Crosbie was game to the televised nuptials, but quickly cooled to the idea. The couple arrived at Garrett’s West Virginia home on Wednesday, June 25th. Etta stayed at Jesse’s house that evening while he stayed with friends. The issue as to where the couple would ultimately settle popped up quite a bit in the press. Etta preferred to live in Indiana, stating, “The mountains make me think I’m smothering.” Jesse was initially a bit more open minded, “I could be happy with her no matter where we were,” but seemed to be leaning toward residing in West Virginia. On Friday the couple made their way to the Thomas Memorial Hospital in South Charleston, West Virginia to get their obligatory blood tests. After that, they headed to the county courthouse to obtain a marriage license, but several legal difficulties prevented them from doing so. First, Etta was not a resident of the state. Second, they were told that they would have to wait three days before they could wed. And, finally, they wished to be married by a justice of the peace, which was not permitted under West Virginia law. They were thinking of heading to Kentucky to marry, but for some unknown reason that plan fell through. By Tuesday the couple was back in Indiana, attempting to obtain a marriage license in Jeffersonville. That didn’t work out, so the next day they were back in Rockport, but the county clerk there would not accept their West Virginia blood tests. The couple’s next stop was the nearby small town of English. The Justice of the Peace there, George Megenity, was willing to perform the ceremony, mainly because the deputy county clerk had failed to notice that their blood test was from out of state. Finally, on Wednesday, July 2, 1952 at 12:45 PM the couple became Mr. and Mrs. Jesse L. Garrett. The wedding took place at the law office of Henry Mock with Mr. Mock and reporter John M. Flanigan acting as witnesses. The bride wore a yellow dress with a floral pattern on it and a white hat, gloves, and shoes. Due to the extreme heat of the day, the groom opted not to wear a jacket, but did put on a tie for the occasion. A five-diamond wedding band sealed the deal as all of the couple’s children looked on. From there, the newlyweds and their children left for a short honeymoon in Elkhart. After that, the plan was for them all to head back to the Garrett home in West Virginia. That was never to happen. One month later, on August 5th, it was revealed in the press that Etta never came back to West Virginia with Jesse. The total length of time that the two were married before they went their separate ways was two days and seven hours. Jesse blamed it on her refusal to move to West Virginia, but, while he never mentioned it, he clearly refused to live in Indiana. Jesse obtained a lawyer and filed for divorce. Etta, in turn, filed a cross divorce complaint against him. The divorce was granted on March 22, 1953 and Jesse was ordered to pay Etta $40/month alimony. That would be approximately $380/month today adjusted for inflation. From there, it appears that Jesse Garrett’s life seemed to spiral out of control. His supposed life savings seemed to vanish overnight. “The $28,000 just melted away… A whack here and a whack there.” He explained, “The money went quick. First, I spent what cash I had; then I spent what was set aside for my boys’ education; then I sold some notes I had; and I mortgaged my house. Now they’re foreclosing on me.” The reason his home was being foreclosed upon was that he had borrowed $3,500 from a Charleston loan company and was unable to repay the loan. On February 26, 1955, Domestic Relations Judge Herbert Richardson found Jesse to be in contempt of a court order by leaving the state without permission, disposing of personal property, and for refusing to make those mandatory $40/month alimony payments. Five days later, he posted bond and was released. His bondsman, Mark Wisman, must have had second thoughts and dropped his surety. Next thing you know, on Sunday March 13th, Jesse was right back in jail. He was released the next day on a new surety. After that, Jesse vanished. He was due back in court on March 21, 1955, but was a no show. In a registered letter that Jesse sent to the court from Nashville, he stated, “Please postpone my case for 30 days. There is serious illness here.” The judge wasn’t buying it and ordered Garrett’s arrest. 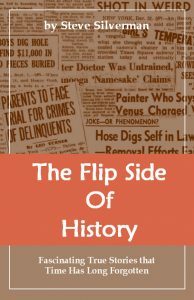 Instead, the court was bombarded with letters and postcards that Jesse penned claiming everything from being framed to kidnapping to outright robbery. On September 25, 1955, Judge Richardson declared his bond forfeited and Jesse’s story was dropped from the headlines. I was unable to locate any further information on how this matter was resolved, so if anybody out there knows, please let me know. 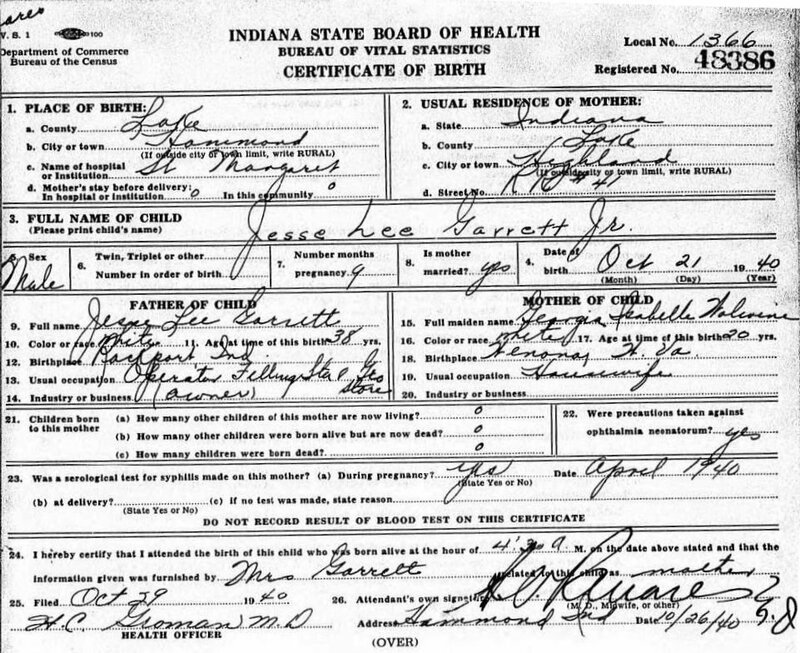 Birth certificate for Jesse Lee Garrett, Jr. The next time that Jesse would be in the press again was on September 4, 1974, but it had nothing to do with his marriage to Etta Crosbie. This time, Jesse and his son Jesse, Jr. were arrested as part of a drug sting. Basically, there were two men in Arizona who smuggled marijuana into the United States in 600-pound (272 kg) lots and once it was shipped to the East Coast, the Garretts and others would distribute it to West Virginia and Virginia. Jesse, Jr. was sentenced to five years in prison with just 270 days served and the remainder a combination of a suspended sentence and probation. As for his dad, he told Judge K. K. Hall, “I’ve made a lot of mistakes, but I’ll do whatever the district attorney tells me…” Jesse, Sr. was sentenced to three years’ probation. Henrietta “Etta” Rems Crosbie passed away on January 8, 2008. She was 89-years-old. 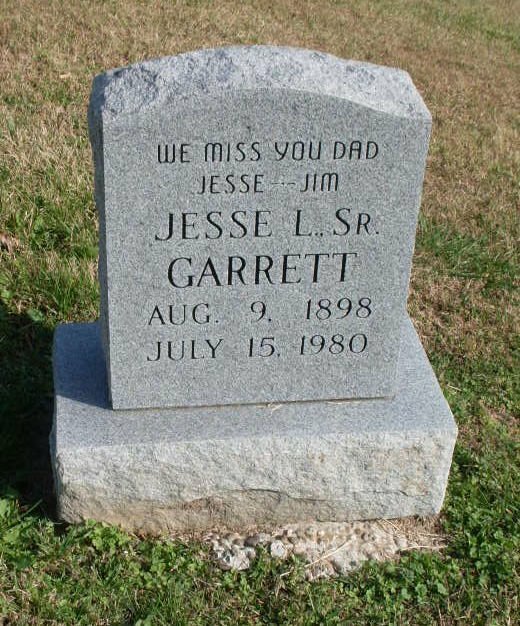 Image of Jesse L. Garrett’s tombstone in the Sunset Hill Cemetery in Rockport, Indiana. Image from Find-A-Grave.